The WheelChair Carrier Model 210 Lift ‘n’ Go electric powered carrier is designed for most of the scooters and power chairs on the market. It features a 350 lb. weight capacity and large lifting platform. The simple pushbutton operation which lowers and stows the platform makes this carrier easy to use. Best value for a full sized power lift. Works with 95% of scooters and power wheelchairs available today. Available for Class 2, 3, 4 or 5 receiver hitches. 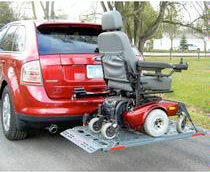 Built in angle on platform to allow for a smoother ride while transporting your mobility unit. Hitch Height Range: 7" to 19"